Away from the spotlight, while Europe was biting its nails over Trump and Iran, one of the continent’s most far-flung corners had itself a peaceful revolution this week. It may be too early to tell, but it’s worth asking: Could Armenia’s textbook ‘love and solidarity’ revolution hold the key to successful transitions of power elsewhere? 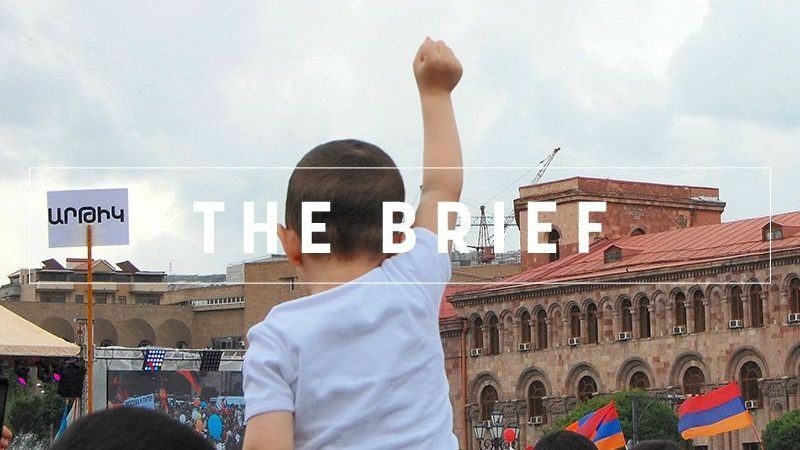 It’s not often that the South Caucasus makes headlines for anything other than violent conflict but the fall of former Prime Minister Serzh Sargsyan and rise of Nikol Pashinyan showed that the region is more than capable of bringing about change through peaceful means. Once enough Armenians were concerned that controversial political reforms would put their country on the road to authoritarianism, Sargsyan’s days were numbered and mass public support propelled opposition rival Pashinyan to the top government job. The protests were some of the most good-natured and colourful seen in recent years. Over the course of nearly a month, there was a remarkable lack of police interventions against protesters and a similar absence of over-zealous behaviour on the part of demonstrators. Arrests were made but all parties have since admitted the scope was blown out of proportion. But don’t underestimate the lengths Armenians went to in order to make their gripes known though. Streets of the capital were blocked, the airport was cut off, public squares were occupied and ruling party politicians prevented from getting a good night’s sleep by protesters camped outside their homes. Although it took some time to convince Sargsyan’s Republicans to back Pashinyan, he was eventually given the nod to serve as the interim leader and will call elections later this year in order to try and form a majority government. The atmosphere has proved to be so peaceful that even the deposed Sargsyan has remained in the country: not the usual hallmark of revolutions, where former leaders waste no time in catching the last chopper out of Saigon. Protests of a similar slant have swept the EU in recent months, particularly in Hungary and Poland, but also Romania, Spain and the United Kingdom, as issues like rule of law, the Catalonia question and Brexit have drawn people en-masse into the streets. At his first press conference as PM, Pashinyan refused to be drawn on parallels between Armenia’s revolution and scenes in Ukraine and beyond, insisting he is only interested in internal matters. But the very basic concept of what has happened in Armenia is surely relevant to all people dissatisfied or afraid of what their elected representatives are doing on their behalf. Namely; that violence is not a prerequisite for a change to come about. That is why Hungarians, Poles et al should take heart from their Armenian counterparts. The pressure told and Sargsyan admitted he had made a mistake. Shutting up and accepting things the way they are shouldn’t be the default course of action. ‘Velvet’ is the new black. After two months of wrangling, Italy may be close to forming a government. Future coalition partners seem keen to leave the eurozone but European Parliament President Antonio Tajani warned Italy against exiting the euro. Sweden is not only ABBA and Volvo. Read our interview here about a pioneering, eco-friendly project that aims to produce steel using hydrogen from renewable electricity. Macron’s categorical imperatives. The French president described Europe’s priorities while receiving the Charlemagne Prize at a ceremony held in Aachen. Does Donald Trump have any friends left in Europe? Click here to find out. Polish media still under threat. EURACTIV’s partner, Gazeta Wyborcza, describes the pressures on independent media in the biggest eastern member state. Azerbaijan’s capital Baku hopes to play a key role in linking Europe and Asia. Benjamin Fox reports from Baku. Everything points to the end of the Greek bailout in August, Luxembourg’s prime minister says. EU leaders fly to Sofia next week for a mini-summit with leaders of the Western Balkans.